During my gig as food editor at SF Weekly, I set out to review every dim sum restaurant in the city. I'm a big fan of dim sum so this was a labor of dumpling love. When the job ended, I got an unexpected side benefit: I no longer have to worry about giving every lesser dim sum place a chance. I feared I wouldn't be able to return to my favorites for more than a year; now I can go back every weekend. Here's where I'll be going back to. I'll go back here purely for the dessert. 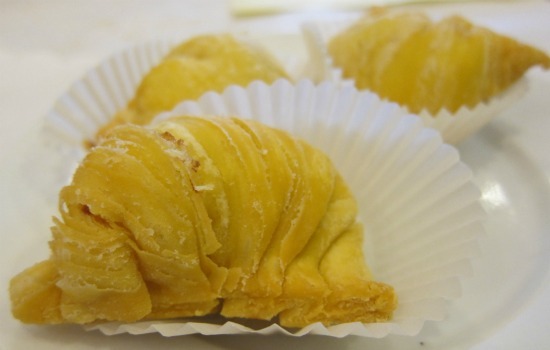 The durian pastry ($2.50) is perhaps the best dim sum dessert I've ever had: pungent, fresh, flaky like it was made in France; a great use of this feral-tasting fruit. Other Lee Hou advantages: It's very cheap and easy to get into. Chicken with sticky rice in lotus leaf ($3) is a highlight. Get the pork feet with preserved bean curd ($3.50) early; the rich, porky sauce makes a tempting dip for other items. 6. Yank Sing I don't go here very often because it costs about twice as much as the next-most expensive restaurant on this list. But I have to acknowledge its quality, as well as its ornate service, with some meats sliced at your table. I like the snow pea shrimp dumplings. If you have to ask what they cost, eat anywhere else on this list. Seriously. A funny place with a giant cabbage god in the huge, empty downstairs room. 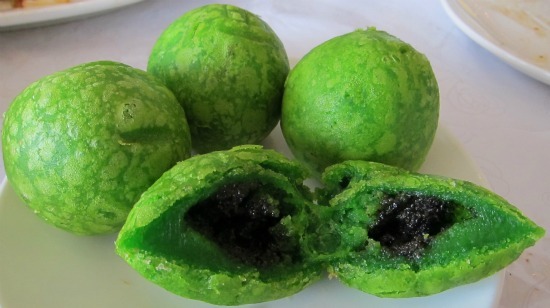 Go upstairs and get the siu mai and the baked pork buns, and don't miss the green tea balls for dessert. 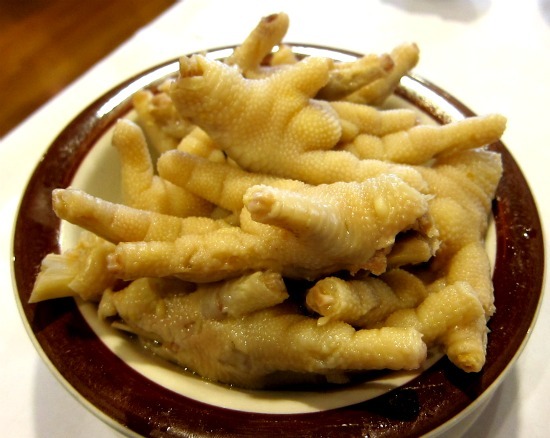 I ordered Crude Drugs Chicken Feet ($4.50) here as a joke, and they turned out to be amazing: like eating solidified chicken soup with plenty of fresh herbs. Can't wait to go back for more, and while there, I'll have more house steamed shrimp dumplings ($2.50), sticky rice with lotus leaf ($3) and steamed Shanghai dumpling ($2.50). For newcomers to dim sum, or people with more Westernized tastes, Ton Kiang should be No. 1. It has more, fresher vegetables than anywhere else. The baked pork bun and foil-wrapped chicken are excellent, and there are few if any outright misses. You'll wait a long time on weekends, but it's worth it. It is the second-most expensive restaurant on this list, but it's far cheaper than Yank Sing. This was my No. 1 for years, but one weak point is a relatively limited dim sum menu that I now know by heart. Still, if you're hosting relatives from out of town, bring them here and be prepared to wait patiently. The crowds here are the biggest in the city, and that's always a good sign. The coffee-rubbed spare ribs ($6), served with a dollop of whipped cream, are memorably inventive; the cream brings out the coffee flavor even more. The baked pork buns are among the best I've ever had, and I order them almost everywhere. Here, there's a crispy crust on top and the chunky filling has a perfect level of sweetness. The shrimp dumplings are large, meaty and studded with ginger. About one in 20 customers here is non-Chinese; I'm always happy to be in that 5%. On food quality alone, it's hard to choose among my top 3. But South Sea Seafood Village has two important advantages: the best ambience, and the shortest wait. 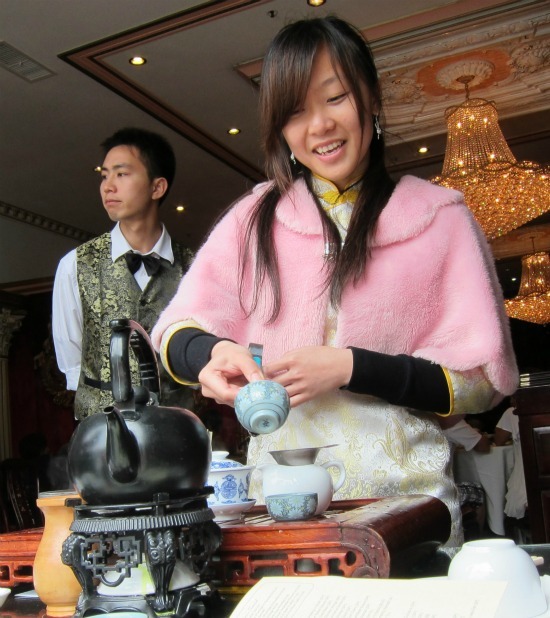 Nobody should visit here without ordering the special tea, which for $3 a person not only gets you a tea ceremony and great tea (I like the pu-erh); you even get a bonus dumpling. 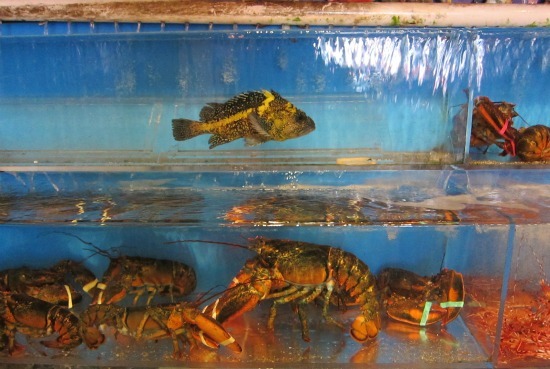 I like to order a fish from the tank (about $18 a pound), steamed with green onion, ginger and soy sauce. The cilantro fish rice noodles ($6.50) are my favorite version in town of a dish I usually find too bland. Garlic sweet pea ($5) is served cold and crunchy fresh. Don't skip the last dish on the menu, sliced cold pork shank with jellyfish ($5). But since the short wait is such a plus, maybe I shouldn't be telling you all this? Good recommendations! 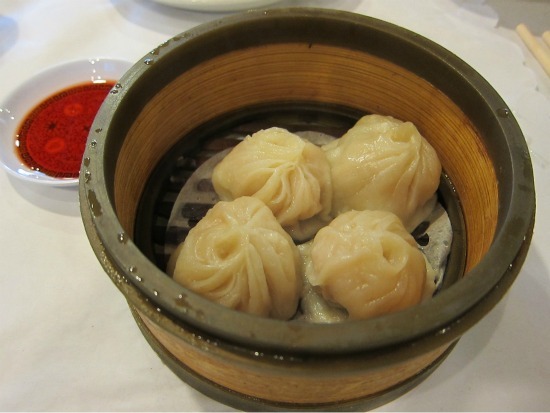 I love Dim Sum and will have to check it out next time I'm in San Francisco. But I'm headed down to Orange County/LA area later this month. Do you have any good Dim Sum recommendations down in that area I could check out? Sorry, I don't, and I'm sure there's great dim sum there. Dim sum is under the radar for most food bloggers, unfortunately. Dim Sum is my favorite and Yank Sing, despite the cost is the place for me. I haven't been to all the places you have listed in SF, but I will try them out. This post made me very hungry. I love Taiwan Restaurant's chicken dumplings. They don't do the full dim sum but their dumplings are very good. Thanks for giving the addresses. What, you didn't give the addresses? Then thanks for nothing. @anon: If you click on the name of the restaurant in Blake's post, you will go to a page that contains the address and a map. You're welcome. Anon: You are entitled to a full refund of the money you spent reading this post. So thank YOU for nothing. I love Hong Kong Lounge and those amazing coffee ribs, and discovered a good place in Chinatown, Great Eastern. Is Lee Hou actually closed now? The website is still up but the number is disconnected. A Yelp review said there was a story in SFWeekly about an ADA lawsuit closing the restaurant, but I didn't find it when using the SFWeekly search for "Lee Hou". I like your list, but would reverse it (Lee Hou being my favorite with Yak Sing my 2nd favorite).